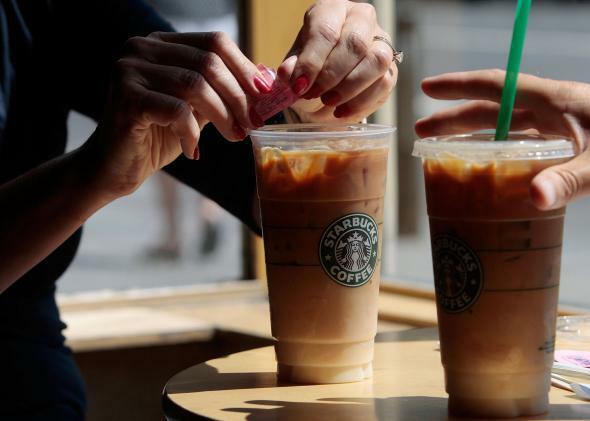 #Racetogether: Starbucks has an awkward plan to heal race relations in America. And if a customer asks you what this is, try and engage in a discussion that we have problems in this country with regard to race and racial inequality, and we believe we’re better than this. And we believe the country is better than this. And if this makes you have a conversation with a customer about the need for compassion, the need for empathy, the need for love towards others, if you can do that with one customer, one day, then you are making a significant difference as we go forward. Mercifully, baristas are not actually required to start these chats, just encouraged to. Usually, when companies start talking about social causes, it’s safe to write it off as do-gooder brand-building. But #RaceTogether seems so ill-conceived that I can only assume it’s coming from a sincere place. And certainly, there are more awkward ways to engage customers who are trying to get their morning coffee. For instance, baristas could demand that every customer who orders a skinny, double-shot latte justify their personal position on abortion. Or, they could make them dance for their drinks, like McDonald’s did. But while the phrase RaceTogether suggests a fairly bland message of social solidarity, I cannot imagine there are many people who want to talk about the fetid state of American racial politics during their afternoon work breaks. So, I guess good on Schultz for following his heart? But then again: Maybe this could be an interesting bit of brand-building. After all, baristas have some discretion here. Presumably, they’ll be more likely to take part in this effort, and talk to customers about it, in the sorts of liberal-leaning neighborhoods where it will be welcome. And the message that Starbucks cares enough about the way minorities are treated in this country to force the issue in its stores might help it cultivate some goodwill, especially since it’s somewhat associated with the gentrification of low-income neighborhoods. Plus, the more journalists (like me!) call this whole thing crazy, the bolder the company could seem. Anyway, this idea apparently came out of a series of intracompany town-hall meetings that Starbucks held in the wake of the Ferguson, Missouri, and Eric Garner tragedies to talk about employees’ personal experiences with race. (For what it’s worth, that seems like a legitimately compelling and brave bit of corporate soul-searching, since 40 percent of the company’s workforce is made up of minorities. Trying to build understanding and trust on these issues within your own ranks probably isn’t easy, but it’s laudable.) Schultz then decided it was time to bring the conversation to its coffee houses. The campaign is also going to involve a bit more than slogans on paper cups. The coffee chain is collaborating with USA Today, for instance, to produce a large insert about racial inequality that it will carry in stores. Worth noting: This isn’t the first time Schultz has tried to use the power of coffee cups to make a political point. During the fiscal cliff debate in 2012, he urged baristas to write “come together” on the sides of cups to encourage bipartisanship. That effort seemed to pass without a great deal of controversy, though Paul Krugman did write a pretty spot-on column ridiculing it.